The primary reason is that Shutterfly promoted its products (of which a photobook is only one option) to a group of people that fit right within its target demographic. Identifying and narrowing down the customer demographics of a business is crucial to a business’ ability to target that audience in specific ways, and more importantly, through the channels they navigate. Most travelers flying from Hawaii to mainland USA are leisure travelers and vacationers, whose carry-ons are filled with camera cards, cell phones, and even laptops that have tons of pictures that they want to keep forever — even if they don’t look at them ever again, but that is a whole different discussion. Who could possibly be a better audience for a company whose products focus is on quality prints and using those photographs to make collectables? 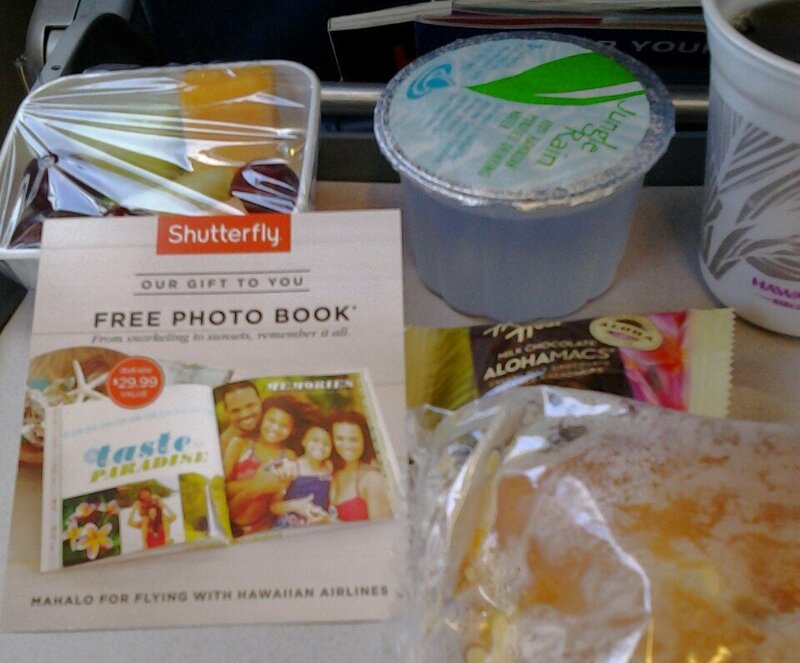 Shutterfly targeted this audience with spot on advertising through the transport that they are most likely to use. Once the customer demographics are narrowed down, and you know what channels they navigate, you then know where your promotion and marketing needs to focus. When you do that marketing and promotion, you need to emphasize the benefits of your products, whether they are rational or emotional, over the features. If your product was a movie, the benefits would be the leading actor and the features would be the supporting actors. While both are absolutely essential to its success, the leading actor is likely the reason you go to the movie and the reason you remember it and recommend it. Leading actors always pull focus in a movie, and many times will receive the most screen time. The marketing materials that you produce should be no different – the benefits need to be in the spotlight, much like that leading actor. The features, on the other side, are to carry a supporting role, an important role no question about it, but supporting nevertheless. The family smiling happily in the middle takes the spotlight because they are the largest image. They also happen to be in the middle, something very important to note. We know that the spotlight in your products’ or services’ promotion is reserved to their benefits, whether rational or emotional. Are the family pictures showcased in the card’s spotlight benefits of either kind? Indeed, the pictures showcased on the card, which include a picture of the family snorkeling, two pictures highlighting the beauty of the islands, and two more of the family just bonding. The photos preserve the memories, which is a great emotional benefit. Third reason – good execution of the free bait. Can you guess whether I went ahead and ordered the free photo book? Why do you think I did? Yes, I did. I ordered because the leading actor, or the emotional benefit, grabbed my attention and the supporting actor, the free book, didn’t cost me any money and was a real value to me. Now, be careful, because not all free things come free – instead, they can end up costing you more. The emotional benefits in the Shutterfly ad grabbed my attention because it was free and provided me with value. Now, a word of caution that sending out freebies that aren’t actually free can work against you. Plenty of companies use the freebie as bait, but end up charging the customer or not actually giving the item away for free. These spammy freebies have caused consumers to be hesitant, even with legitimate freebies, and they will be extremely cautious. Do not do this, as consumers can look upon your brand negatively. Clearly communicate what you are offering for free and disclose any other charges that the consumer may incur – even if it is just shipping and handling. You must deliver what you advertise so that your customer is pleased and impressed with your service. Economist Harley L. Lutz warns “There ain’t no such thing as a free lunch,” and that is true here as well. I signed up for the free offer, and as it turns out, it wasn’t free. I ended up paying $21.95 for the “free” book, two additional paid features, taxes, shipping, and handling. I knew what I was paying from the get go, so I wasn’t really upset about the extra charges. While this might prove to some people that there is no such thing as a free lunch, in all fairness the offer never said that everything would be free. The offer was a free appetizer as it disclosed clearly that the dessert (shipping and handling) was required and it was not included. I enjoyed my meal, as the experience was positive and never did I feel mislead by having to pay for the dessert (shipping and handling) as I aware of this charge from the beginning. Whether you offer a free lunch or just a free appetizer as the free bait, it is important to figure out whether you can afford to give it away. While there really is no unbreakable rule for how much you should spend for it to be effective, some experts recommend limiting it to up to 10% of your monthly sales. Apart from limiting your expense to a rational amount, you will need to do some educated estimation as to what percentage of your customers who do take that free lunch or appetizer, will also add a paid drink to it or come back again for a second one. After all, this is the ultimate goal of the free bait marketing strategy. Free dental cleanings allow dental hygienists to assess whether additional cleanings or further oral care is needed. Chiropractors’ free massage sessions allow them to identify any issues that require further treatment. Accountants’ free 1 hour consultations allow them to determine what services to offer based on the customer’s questions and concerns. Products can equally benefit from providing free lunches, especially when launching a new product in the form of a free item or to increase awareness in the form of samples. Whether it is a service or a product, free lunches can never have strings attached or hidden fees or you will put off the entirety of your potential market. Don’t forget that people talk. Free note cards for Valentine’s Day, which, similarly to the free photo book that opened this blog post, had a shipping fee associated – clearly disclosed. The shipping fee usually adds a margin which in this case helps offset the production cost of the giveaways. Free smartphones – have we not seen this promotion very often since they took the market by storm? This is of course, a free appetizer not a free lunch, as there is a 2 year contract agreement required. This requirement is disclosed, however, in the promotion’s fine print and was also likely discussed at the store. If you decide to offer a free lunch, remember that your goal must be for your customers to return and pay for it several times over. Just remember that you have to deliver, or no one will be making that journey back to you. If instead of offering a free lunch, you go for the free appetizer where a paid desert is required, the goal remains the same – having your customers return for a full paid lunch or higher margin free appetizer. In either case, identifying the needs of your customer and impressing them with your customer service is the golden key to the free bait marketing strategy. As always, we’d like to hear from you! Have you come up with a great free bait promotion that works wonders? Maybe you have a quandary about what kind of free bait you can provide that is both effective and doesn’t break the bank? Kolau can help! Just let us know on Twitter at @KolauMarketing, or via email at info@kolau.com and you may see yourself on the blog’s section Ask Dan’s weekly.